Zika Update- Mass Chemical Spraying Before All Dolphins Games to Officially Begin! It's official. The Miami Dolphins NFL football team has announced that this fall before every home game massive chemical pesticide spraying will be conducted to supposedly combat Zika virus, the totally benign virus which just recently (last year in 2015) was recreated by the mainstream media and turned into a scary killer virus which supposedly causes microcephaly in newborns. The Miami Dolphins aren’t messing around when it comes to the Zika virus and the health of their employees and fans. As a means to combat the virus, the organization has been aggressively using EPA-approved chemicals in and around the newly dubbed Hard Rock Stadium, where the Dolphins play their home games. “All month, the Dolphins have been treating the 265 acres of property around the stadium, including parking lots, as a precaution, and in the interest of fan safety. The Dolphins are contracted with a pest control company that has followed CDC (Center for Disease Control) recommendations in its multi-step approach and are using products deemed safe for people, pets and aquatic life,” writes Joe Schad of the Palm Beach Post. The team is targeting areas where water drains, areas of standing water and basically anywhere else mosquitoes could potentially be found. Backpack foggers are going to be used every two weeks. Additional treatments will happen two days before every Dolphins game, as well as any Miami Hurricanes games, that occur at Hard Rock Stadium this year, per the report. 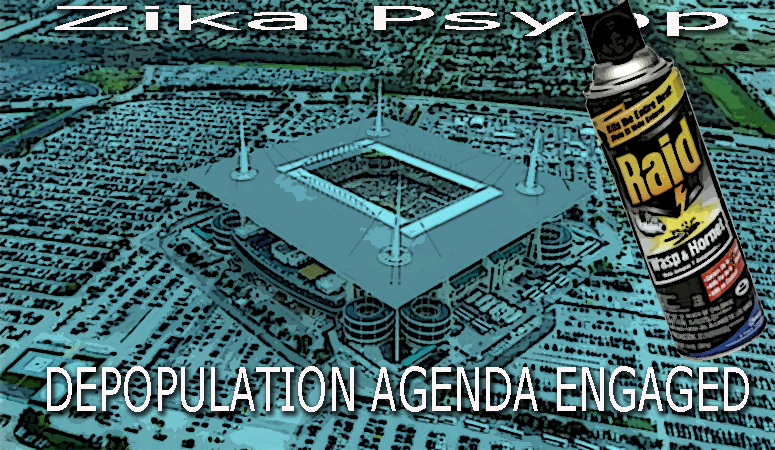 So based on the power of the ministry of truth mainstream media Zika virus unproven claims the mass depopulation agenda is a full go in Miami and will be forced on innocent sports fans and anyone traveling or living near Hard Rock stadium in Miami. I've been predicting a huge Zika virus psyop scare for this fall but I didn't see this quick reaction coming at this level. Now hundreds of thousands of fans will be exposed to chemical pesticides they are told is deemed "safe" by the CDC. Mixed in these massive crowds will be pregnant women and unborn babies sucking up pesticides into their innocent and undeveloped nervous systems. This is undoubtedly intended to create what could be an epidemic of birth defects in Florida which will be blamed on, you guessed it, Zika virus. This is one of the most evil agendas imposed on innocent Americans and the whole process of jumping to conclusions about Zika virus was one of the most unscientific, knee-jerk, quick reactions to a non-problem I've ever seen. Frankly I believe this marks a dark and frightening moments in American history and for medical freedom and human dignity. The tyrants are now imposing their genocide on all of humanity and these mass decisions are now based on whatever "stories" they want to conjure up. Science and reason no longer matters. As I've written about for almost a year, Zika virus is a benign virus which is unrelated to microcephaly and birth defects as a whole. The cases of microcephaly seen in Brazil in 2015 (which is when this psyop began) was confirmed by doctors in Brazil to be associated with the northern region of Brazil heavily sprayed with pesticide. Since 2007, when Brazil's health ministry began keeping current records, the number of reported cases of human intoxication by pesticides has more than doubled, from 2,178 that year to 4,537 in 2013. The annual number of deaths linked to pesticide poisoning climbed from 132 to 206. Public health specialists say the actual figures are higher because tracking is incomplete. So how ironic is it that the fake "solution" for the Zika virus lie is more pesticide. Again, this is mass genocide and everyone should treat this as such. Help spread the word to all Dolphins fans and all NFL fans and let them know it's time to boycott these big sporting events. Don't give to these professional sports team owners if they are going to ignore science reason and more importantly medical freedom. I repeat, the only way to fight back here is with education and by choosing where to spend your money.